In a previous post, we showed you how to dress your table and give your dining room some spring freshness with the Republic range check tablecloths. This post focuses on an altogether more versatile tablecloth, one of the most popular tablecloths we sell, and a range which boasts the most variety in colour. Huge at the moment is a nod to a more rustic natural trend for homes, and for most occasions also. In most retail homeware departments, and online inspiration sites such as Pinterest, a more natural colour palette is taking over. 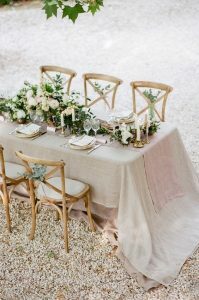 Add to this accents such as greenery, botanical wildflowers and metallics it is easy to dress up a plain cloth such as a Shell tablecloth. Colours such as meadow green, cream, dusky pink and coffee lend themselves well to this trend, as they are understated shades which are easily accessorized with, meaning you get more bang for your buck as a simple cloth outstays the quickly transitioning world of fashion just by changing the add-on decor rather than the basics like linen. 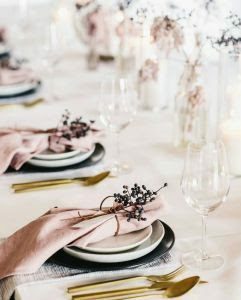 The meadow green cloth, with even plain crockery, and some greenery such as ivy or ferns, or some bright spring blooms will make your table the envy of any home decor expert. Brighter colours are easier to accessorise with as they traditionally don’t need much in the way of decoration added at all. A few candles lit, and you are good to go. Shades such as red, terracotta, bottle green and aubergine are perfect dinner party colours and look especially elegant when paired with golds and silvers. The shell tablecloth range also encompasses napkins to match each cloth, although mixing and matching with the variety of colours available is also very easy. 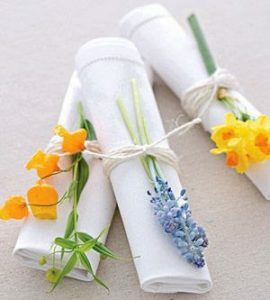 Try tying some rustic hessian string as a simple napkin ring, and tucking some wildflowers, such as lavender or even some ferns for a natural chic accent to your table setting. The Shell tablecloth comes in a variety of shapes (oval, oblong, square and round) and many sizes to suit every kind of table. They are plain with a textured weave and have a scalloped edge. Perfect for home or for more commercial use, such as in hotels and restaurants. Easily dressed up for occasions such as weddings. They are machine washable, stain resistant and non-iron so ideal for everyday use and hard wearing.